I think I am now fully recovered from my Polish travels. Among many good things that came out of my trip there is one that I especially cherish, for its linguistic applications. I think I now am fully at peace about the interchangeability of the languages I know to different extent. I used to think that if I switch between them, I will dig myself into a full linguistic confusion and won't be able to express myself properly in any language. I liked to keep my languages as separate as possible. I think it was the necessity of buying materials to learn Norwegian - materials that were prepared in Polish - that made my understand how silly I was being. Needless to say, I now intend to take a full advantage of all the languages I've been playing with. I was even considering getting the Assimil Norwegian course done for French speakers, alas, I'm not yet so brave. Norwegian-wise, last week was used for a bit of a review. I was trying to get my Norsk to the pre-trip levels and work out some of the long-term goals I would like to set. Even though my changeable nature is already demanding another language, I decided that Norwegian will stay with me till the end of 2013. I am hereby scrapping my original goal of the B1 level by mid-September, and giving myself a few more months for the same linguistic scope. I think it proves maturity of both my resolution and my resolve. I am very proud of myself at this moment and I won't let this feeling be interrupted by any silly reminder that a won't be achieving my goal at the speed of light after all! I will now go and read some more of Anne fra Bjørkely - at the most leisurely speed. Aside from the phrasebook mentioned before, I returned from my European travels with another resource to learn my current language of choice. It is a little book by Stanisław Łęcki called Język norweski dla początkujących (in English that would be Norwegian for Beginners). The only issue I have with it is the title - after all I would like to believe - even if it would necessitate lying to myself - that I am no longer a beginner. However, I did have a 2.5-week break in my Norsk studies, and even though the book is theoretically meant for beginners, it will get me very nicely to the intermediate stage. I also find the organization of the material very comforting - it is exactly what I'm most used to. First there are some dialogues, then a piece for reading comprehension, then the vocabulary, grammar and some exercises. I know this is the most traditional way of teaching a language, and not necessarily the most effective one, but after many attempts at more modern methods I decided that the presentation of the material in the newer textbooks is quite distracting to me. I especially dislike the colorful A4 format language textbooks and workbooks, where the page is so crowded with pictures, text, exercises and cultural notes of all kinds that there's no room for the learner to make it their own. Give me a white page and I will make it colorful and meaningful - to me - in no time. It's hard to make memorable pages that are already as colorful as they can be. So I appreciate the unimaginative character of Język norweski dla początkujących and the lack of distractions in the book. On another note, I believe that even though I stopped Norsk for some time, listening to the Klar Tale podcasts affected my ability to guess Norwegian pronunciation very nicely. When I first started learning the language, my main problem was that unless I heard a word pronounced, I would not be able to figure out how to say it. It's different now - I can extrapolate from all my experience with the language, and sometimes I can even get the tonality of the language almost right. Although I still think with nostalgia to the times when I thought phrases like "Hyggelig å hilse på deg" were the most difficult things to say ever... I am so much better now! Well, I decided that Norwegian in Poland will just not happen. But I'm at peace. 2 weeks and 3 days' break will affect my fluency but it's nothing I intend to lose sleep over. I will step on it when I come back from my trip and I expect to be back to the pre-trip levels in 2 days or so. 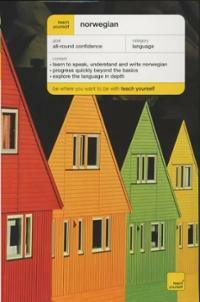 In the meantime I purchased a lovely Polish-Norwegian phrasebook. I know, I know, I was supposed to do this one on the cheap and not overdo it with resources but the little book was calling to me from the shelf and I had to answer. It was very pleasant when I opened the book and found many, many phrases that I already knew very well. Although my usual Norwegian studies were happening in the English-to-Norwegian direction, not Polish-to-Norwegian, so I am a bit confused. But what's the point of knowing several languages if one is not prepared to use and abuse them every which way? So close to Norway, so far away from Norsk! I'm worried about the state of my Norwegian. I'm worried because even though I happen to be visiting a country that's much closer to Norway than Canada (where I usually learn Norwegian), I feel absolutely no need to do anything intellectual - and I suppose learning a language belongs in that category. I suppose over-seas vacation means that one should do different things than at home, or nothing at all. Nah, that can't be! Maybe because on my vacation I am forced to speak my native non-English language, I'm a bit afraid to add another language into the mix. I already have trouble translating my life, which happens in English, into Polish, so that my relatives could understand it. Would intensive Norsk studies not confuse me even more? In the meantime, I'm staying in touch with the language by reading Klar Tale and listening to a bit of the language every day. But the fact that I may not be able to do any intense language studies is worrying me, especially considering my goal to get to B1 level by mid-September. I may have to rethink and reschedule the goal - but that will happen later, once I know for sure. And now I allow myself to enjoy the proximity of Norway. Today, at the beginning of week 5 of my attempt at Norwegian, I celebrated a little. Since my knowledge of the language is probably hovering somewhere between A1 and A2 right now (closer to A1 than A2 but I will not allow this detail to deflate this balloon in which I'm currently traveling across the sky), I decided I deserve a little acknowledgment of the knowledge I acquired. 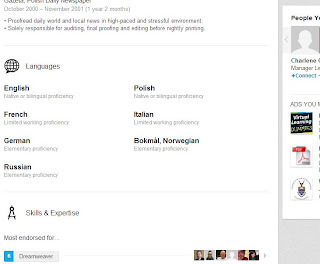 So instead of a little medal or a blue ribbon, I gave myself a virtual nod - I added Bokmål Norwegian to the languages I speak on my LinkedIn profile. 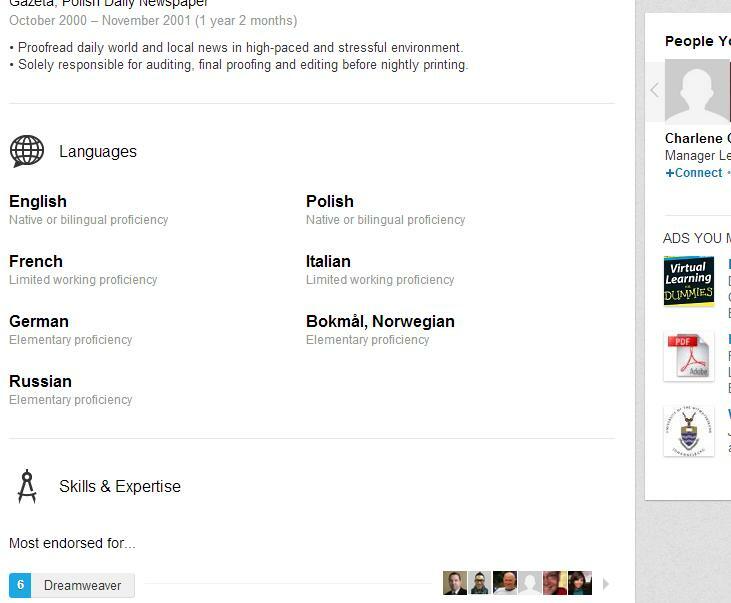 Thank goodness LinkedIn allows for some indication of the proficiency level of the languages that people (claim to) speak. I wholeheartedly indicated that my proficiency level happens to be "Elementary proficiency". On a moderately related note, I'm finding that the more advanced I become (advanced - doesn't feel right to use this word yet but since this is me patting myself on the back session, I'll let myself have it), the more distracted I become with different resources I find to learn Norwegian. I remember when at the beginning of this journey I was bemoaning the scarcity of the learning materials. Now I have more than enough. I almost feel I'm losing direction a little bit. The different resources are making learning more interesting but they're also making it harder for me to measure my progress. I may remain torn between quantifiable and organic knowledge - and I know most serious language learners are totally pro-organic (maybe with the exception of professor Alexander Arguelles who at any point in time knows exactly how many hours/pages of writing/pages of reading he invested into each language that he's studying) . And I so longed to know exactly where I stand! But I guess that ship (or should it be balloon?) has sailed. I will learn to embrace all my knowledge then, no matter how it was acquired. I tried to read an online magazine in Norwegian today. A bit of a frustration it cost me but it didn't affect my attitude towards the language. The article I attempted is about the movie Despicable Me 2. I found it surprisingly difficult - my tiny yellow dictionary doesn't have most of the words I needed to look up, and I really dislike online dictionaries. As I'm getting over that dislike and the self-disappointment I experienced, I'm exploring another online magazine that I discovered thanks to one of my former compatriots who some time ago attempted an experiment similar to mine - however different his methods. Klar Tale er Norges eneste lettleste nyhetsavis. Større skrift og enkelt språk gjør avisen lettere å lese enn andre aviser. Klar Tale kommer ut hver torsdag som papirutgave, som lydavis på CD og podcast, og som punktskriftutgave. På våre nett-sider klartale.no finner du alltid de viktigste nyhetene. De er alltid lette å lese. Fordi vi bryr oss om at alle skal få informasjon. It speaks to me. And it speaks to me in a language I can understand, even if not completely without difficulties. I have come to the realization that chapter 4 in the Teach Yourself Norwegian book was meant to make me reassess my goals. The fact that I go stuck on it - so desperately that I abandoned the book itself for a few days - served some purpose. Now I can say with some confidence that if I didn't let that one awful chapter derail me in my resolution, my resolution is safe. I still can't say that I defeated chapter 4. There's some massive vocabulary there that I haven't committed to even the short-term memory. Of course that means that I would probably be a horrible sightseer in Oslo - after all the chapter deals with sightseeing in Oslo - but I realize it may be years before this hole in my linguistic education will affect my life. So I decided to do something radical and GET OVER CHAPTER 4. I may go back to it at some point - surely months from now. In the meantime, life is too short. So today I moved on to chapter 5, fully expecting it to be as difficult as chapter 4 was. So I made a plan to change the way I work through the book and instead of trying to do all 3 dialogues one after another in one sitting, I was going to do just one dialogue today. Then another one tomorrow. And so on. It would have slowed me down in my language acquisition but I was planning to add some other methods to fill the presumed holes. However, it turns out chapter 4 was much worse than chapter 5. I'm breezing through chapter 5 and I don't feel any worse for not having completely internalized the content of its predecessor. What IS slowing me down is all the research I do these days about languages, learning and learning languages. Right now I really want to read Stephen Krashen and his theories of language acquisition. I keep telling myself if I spend time on theory I will have no time left for practice, so I'm trying to wait it out and if possible not purchase any huge volumes full of theory. So today I think I will try to do some more of chapter 5 of Teach Yourself Norwegian, work through unit 24 of Pimsleur and read some more of Anne of Green Gables and its Norwegian translation. Lofty goals but it is a sunny afternoon perfect for a walk in the park with some foreign sounds in the headphones. I'm really liking this language!